Chapters Indigo is offering 15% off online right now! 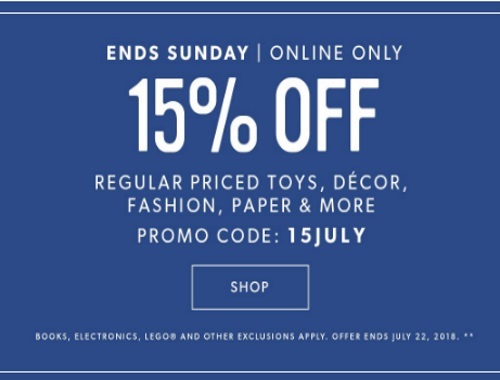 Save on regularly priced toys, decor, fashion, paper and more! Enter the promo code 15JULY at checkout to get the discount. Offer is valid July 19-22, 2018. Excludes books, eBooks, electronics and related accessories, American Girl® (other than Wellie Wishers™), LEGO®, Kate Spade New York, Shinola, Casper, and Benefit Cosmetics products, gift cards, irewards memberships, and Love of Reading products/donations.